The Bluebook. Few books cause law students as much dread, pain, anger, and frustration as The Bluebook. The Bluebook, formally titled The Bluebook: A Uniform System of Citation, is the style manual for citing to legal documents within the United States. It is now in its 20th edition, more than an inch thick, and consists of over 500 pages of guidance on legal citation. Needless to say, it is large, a bit unwieldy, and challenging at first. However, it is an essential book that every lawyer should know how to use. Most of The Bluebook, however, is irrelevant for many people who create legal documents. You can ignore more than two-thirds of the book if all you need to do is to cite cases and statutes -- which covers most of the first year of law school, and a lot of litigation. In fact, if you're dealing only with cases, litigation documents and laws, you might be able to find the answer to your question using the cheat sheet on the inside back cover. This guide introduces The Bluebook and basic concepts of legal citation to new law students. It is specifically written for first-year J.D. 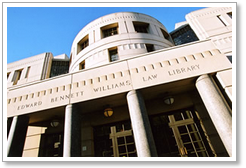 students enrolled in Legal Practice: Writing and Analysis and L.L.M. students enrolled in U.S. Legal Research Analysis & Writing at the Georgetown University Law Center. This guide explains the organization and layout of The Bluebook and how to cite the most commonly cited legal materials, including cases and statutes. This guide does not include explanations of how to cite most administrative law materials, legislative history documents, or international and foreign law resources. Georgetown University Law Center faculty, staff, and students who have citation questions or questions about this guide may contact the Reference Desk. About the Bluebook: Basic information about The Bluebook, including where to find copies in the Georgetown University Law Library. Bluebook Layout: A tour through the most important The Bluebook sections for new law students. Citing Cases: How to cite federal and state cases. Citing Statutes: How to cite federal and state statutes. Citing Other Resources: Basic citation formats for constitutions, federal regulations, books, law reviews, online sources, and court filings. Video Tutorials: Tutorials providing more information on citing cases, statutes, and law review articles.